Sometimes, you may need to restart your iPhone. And if that doesn’t work, you can try resetting it. If your iPhone acts up on you — if it freezes, doesn’t wake up from sleep, doesn’t do something it used to do, or in any other way acts improperly — don’t panic. You have some tricks you can try. Apple recommends trying to restart your iPhone before you try resetting it. A red Slide to Power Off slider appears on the screen. Slide the red slider to turn off the iPhone, and then wait a few seconds. 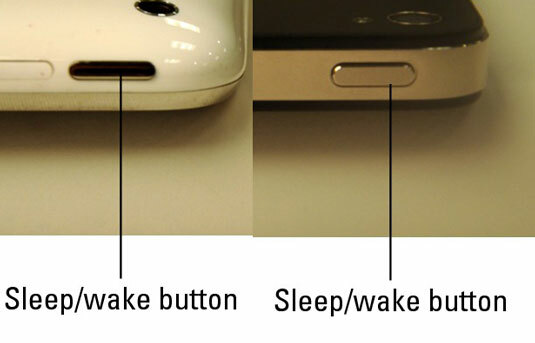 Press and hold the sleep/wake button again until the Apple logo appears on the screen. First-generation iPhone or iPhone 3G: Force-quit by pressing and holding the Home button for 6 to 10 seconds. iPhone 3GS or 4: Press and hold the sleep/wake button until the red Slide to Power Off button appears, and then release the sleep/wake button. Don’t drag the red slider. Instead, with the red slider still on the screen, press and hold the Home button for 6 to 15 seconds. If your iPhone refuses even to restart, you can reset it. Resetting your iPhone is like forcing your computer to restart after a crash. Press and hold the Sleep/Wake button while pressing and holding the Home button on the front. Your data shouldn’t be affected by a reset, so don’t be shy about giving this technique a try. In many cases, your iPhone goes back to normal after you reset it this way.